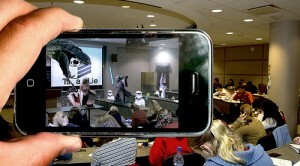 Augmented reality was first punted as a novel marketing technique in 2009. At the time, Apple was one of the first companies to get the bandwagon rolling when it ran an app on its iPhone that allowed Parisians and tourists to find the nearest Metro subway stations. All users had to do was point their iPhone cameras down the street that they were on and the app would show them where to catch the nearest train. Augmented reality (AR) marketing has come a long since then and still experts believe that we’re only touching the tip of the iceberg. If you’ve seen Terminator, Iron Man or Minority Report you’ll know what augmented reality can or will be able to do. At its most basic level, it augments what you see in reality with other data, which could be video, audio, text or image-based. Like the Metro iPhone app, it can use GPS location to deliver information, but it can also recognise images and text to provide a fuller, richer “real” experience. A report released by Jupiter Research in 2009 stated that revenue generated by augmented reality would reach about $714 million by 2014. That’s compared to a projected $2 million in 2010. A huge chunk of that is expected to come from marketing and advertising, especially in the mobile sphere. Pointing your phone down the street could show you which shops are currently running sales or special promotions. Pointing your phone at a restaurant could provide you with an interactive menu or, more importantly from a marketing perspective, reviews, ratings and critiques. Pointing your phone or a webcam at print publications could deliver additional data, either about the publication itself or articles and ads in that particular issue. Stores could set up augmented reality enhanced cameras so that shoppers can hold up products or brochures for additional related information. An application not cited by Network World is price comparison. While shopping all you have to do is point your phone at a product and you’ll see comparative prices. Advertising also becomes highly location specific. Because it’s still quite new, marketers are experimenting with the ways in which augmented reality can make their lives easier, not to mention trouble-shooting solutions for potential problems that the new technology will inevitably bring. As far as digital marketing goes, augmented reality is another step toward an interactive and engaged future.